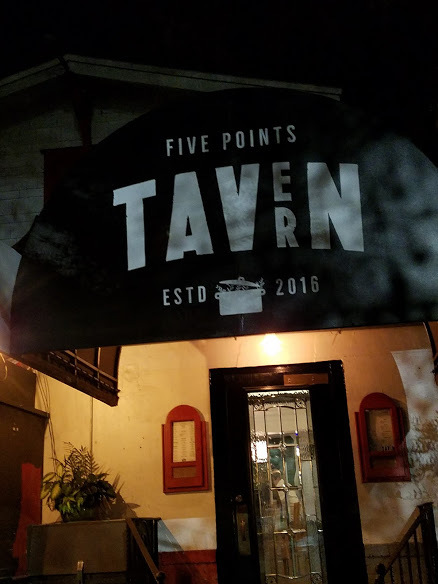 So we waited to make the trip to Five Points Tavern, during that period we polled our foodie friends, read social media reviews, did our due diligence so to speak. When we did go, the three of us had the list of “must try” dishes and for the most part that’s what we did. 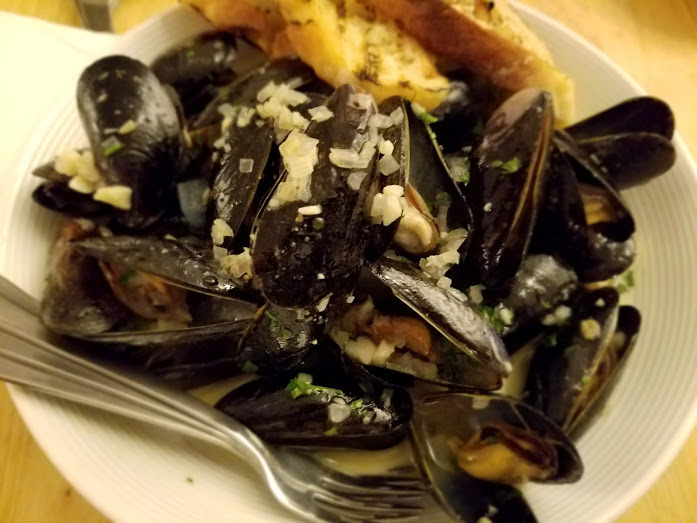 Starting with the appetizers, we selected two of the must-haves listed under the Small Plates; Tavern Mussels a combo of white wine, butter, garlic, thyme, and pernod. Looking at the dish when it arrived we were impressed, well until we tasted it. The mussels themselves were quite small, the broth watery and flavorless. Although heavily sprinkled in garlic none of us even had a hint it was present; we debated between the use of jar or old fresh cloves. The dish pushed aside our server inquired about a problem with the plate; my companion stated it was not up to par and she no longer was interested. Of course, the “let us make you another one” came out, nice gesture but why would anyone want a second mediocre dish? 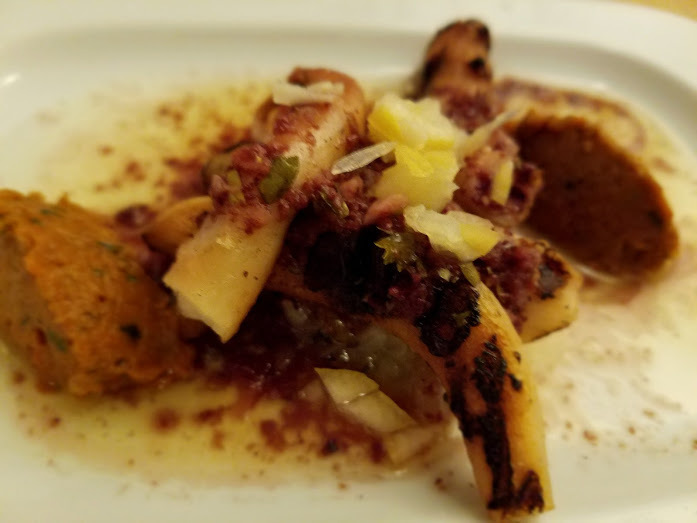 My friend insisted all was good and we proceeded with the other recommended dish Octopus, with melted leeks, romesco, and olive vinaigrette; a poor choice on my part, four small tentacles, nicely charred but tough and dry. I would have paid more for a decent sized tentacle portion that would have been much sweeter and perhaps easier to cook. 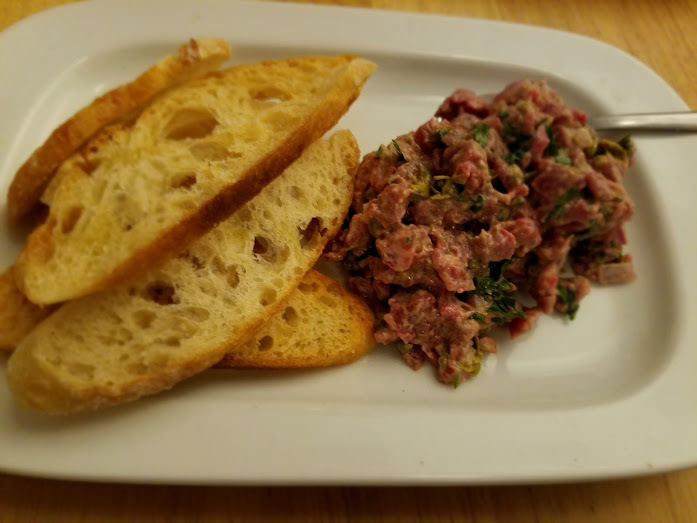 Our third choice from the Small Plate section was the Beef Tartar, with capers, cornichon, aioli, and crostini. We all agreed this dish was the winner of this round. Perhaps not the best tartar we have ever experienced, but by far better than the other dishes we had ordered. Beef TartarMoving on we selected two of the steak choices; the 16oz. Rib Eye, and the Hanger Steak, I opted for the Moroccan Style Lamb Shank, once again we had mixed reviews again. 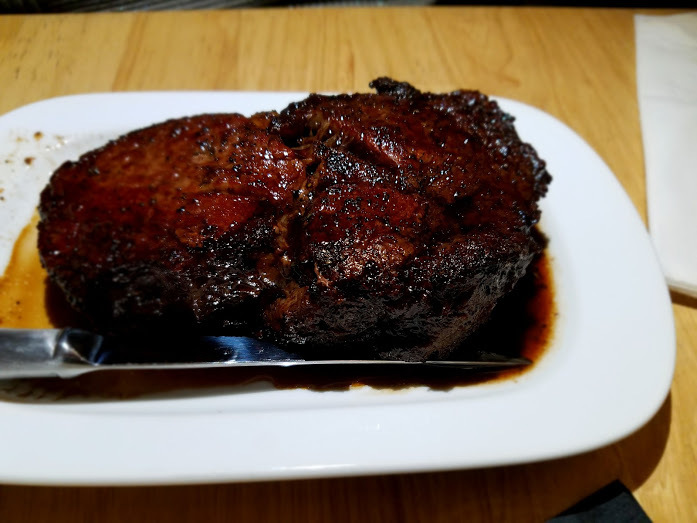 The rib eye, when delivered, showed great promise, was stunning, but once cut into there was almost no marbling that one would expect from this cut of meat; I have to add the fact my companion ordered the meat cooked to medium added nothing to help the lack of the fat. It was weak on flavor and way over cooked for my taste. 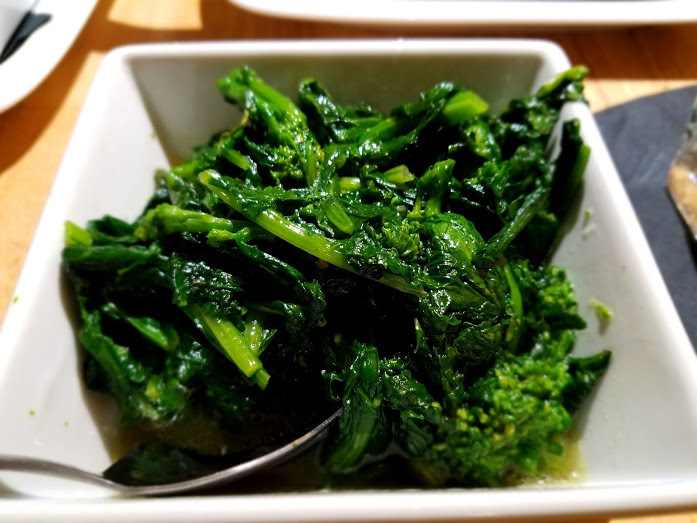 The side of garlic chile broccoli rabe was a throwaway dish, tart, harsh and not a hint of the garlic or chile. 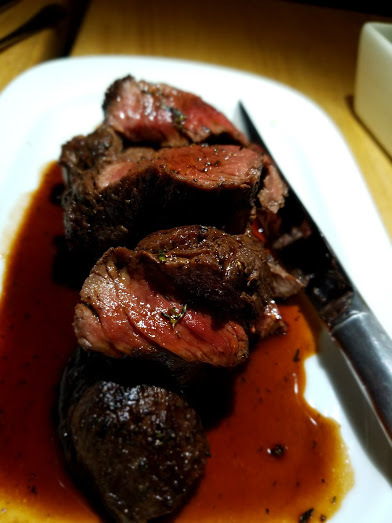 The hangar steak was to total opposite, served medium rare, sliced perfectly resting in pan juices; it was a sight to behold. The meat tender and juicy with flavor it was deemed a winning dish. 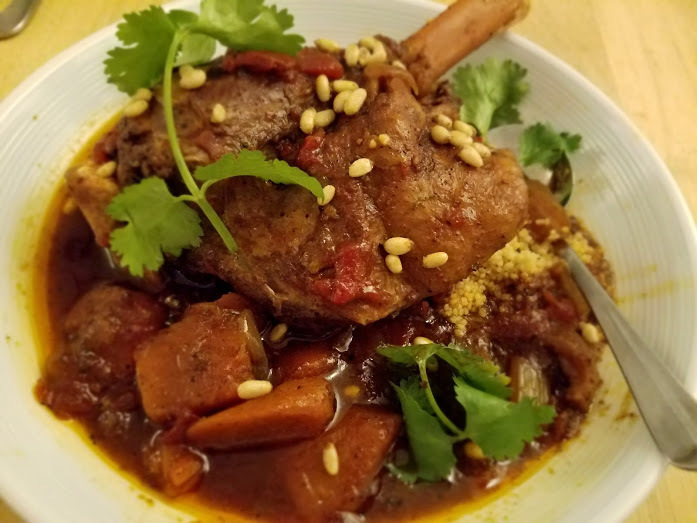 For me, the Moroccan Style Lamb Shank with Couscous was the only way to go. The flavor profile of any Moroccan dish wins me over every time, and this recipe did not fail. Meat is well seasoned; fall off the bone tender, surrounded with an array of vegetables still firm and individually identifiable. I was blown away by this plate. 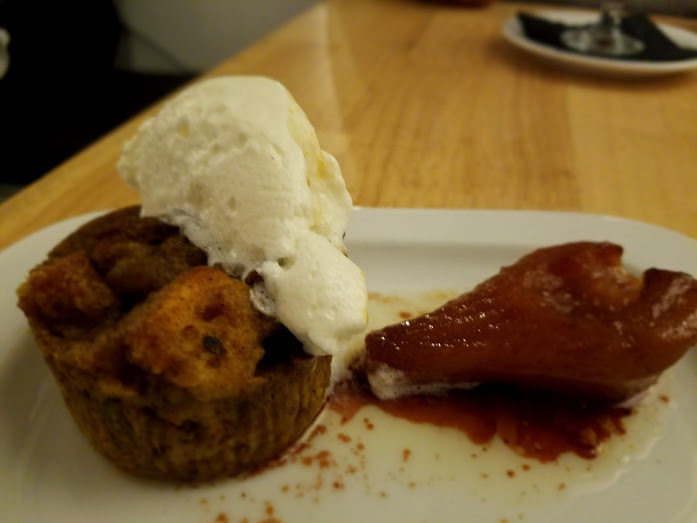 We had some room for dessert, here is the lineup Bread Pudding with Spiced Poached Pear, firm body in the pudding, with a moist center that was well flavored, the pear a perfect companion to the dish. 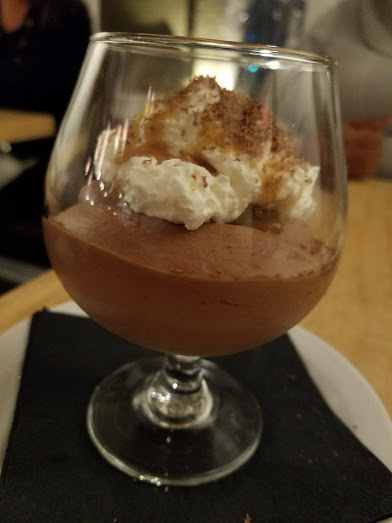 Salted Caramel Chocolate Mousse, beautifully presented, the mousse airy, thick with chocolate aroma and hints of caramel with salt rounded out the flavor. As always I can only say go out and give it a try, make up your mind. Order many different dishes and find the ones you like the best, those are the dishes that will bring you back.